Happy Kitchen Sink Monday! There's a lot of information in today's post, so be sure to read on for all the details regarding the Kitchen Sink Stamps Retirement Sale, and the upcoming Christmas Sale! I used CPS Sketch 121 as the inspiration for creating my card. I sponged the Wassail paper from Basic Grey, with Grey Ink, then picked out Rich Razzleberry, More Mustard and Always Artichoke as my coordinating colors to match the DSP. Using the Big Shot and the Snowflake CuttleBug Folder I embossed the Mustard piece, cut it with Spellbinders Circle Die, and sponged the edges with Going Grey, and attached it to the DSP. 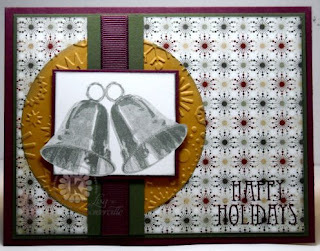 The sentiment from Kitchen Sink Stamps 3 Step Bells was stamped in Rich Razzleberry using a SAMJ. To create the bells, I stamped them as follows on White card stock - Steps 1-2 Going Grey (stamping off first), Steps 4-5 Going Grey, then used the Out of the Box Technique to frame my focal image. When they are gone, they are gone! The Kitchen Cupboard is running out of room! Starting today, the sets listed below will be grouped together (as well as sold alone) in the KSS store at an extra special price, available while supplies last! Use code LISA10KSS to save an extra 10% on your Kitchen Sink Stamps purchases. Love how your bells seem to be ringing in this wonderful sale! I will have to make the best of this opportunity. What a wonderful layout for your beautiful out-of-the-box silver bells!! I love the embossed snowflakes and the sensational colors!! A gorgeous holiday card, Lisa!! So very pretty, Lisa!! Wow, these colors are all so very rich!! Now I have the song "Silver Bells" in my head...LOL!! I'm with Julie... the bells look so real!! Very pretty color combo, too!! This is beautiful, Lisa! Theout of the box technique really showcases the pretty bells. What a fun lay out! I love how all the textures mingle together. SUPER CUTE!